This is the Great Camas, or grand camas, one of six types of camas that grow west of the Rocky Mountains. These plants can grow as tall as 4 feet: these particular flowers stand at 32 inches. 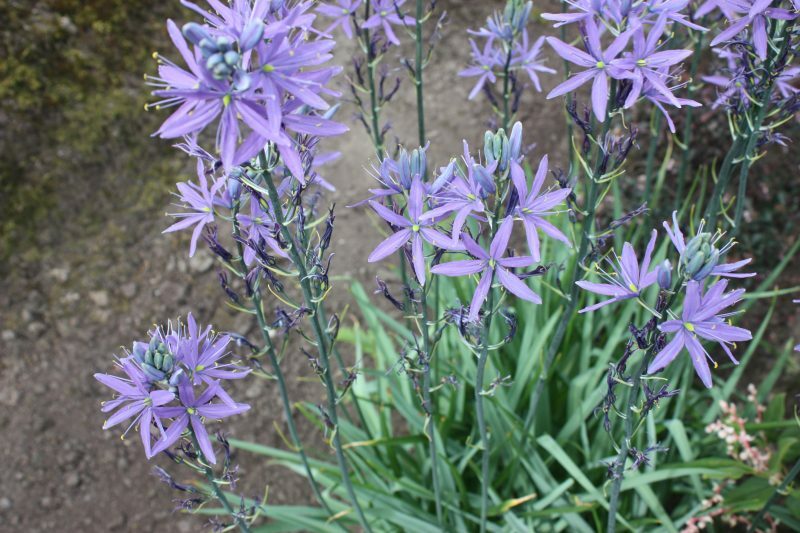 As you can see from my camas posts, I am more than a little fond of the flower. It blooms every year in May, and many people know nothing of it. But it has history, and its stories are being lost! There are five kinds of camas, all different. These are the “Mountain Death Camas,” the “Common Camas,” the “Great Camas,” the “Grass-Leaved Death Camas,” and the “Death Camas.” How interesting: this list was written by a botanical expert and he did not include the “Petite” or “Little Camas” in this list. Hence, there are six types of Camas, and I have found three. The generic name is Latinized “camas,” very happily and properly recognized, for this was the Indian vernacular for an edible bulb. Camas was an essential and stable portion of the diet of the tribes for thousands of years before the white man came. Tribes fought over possession of particular flatlands of rich soil, where the camas in millions spread sheets of dazzling blue. A cruel war in the late ’70’s [1870’s] was fought between 580 soldiers of the United States Army, and a band of 300 Nez Perces warriors under their brilliant leader, Chief Joseph. White settlers had turned their pigs to root out the bulbs in the great “camas prairies,” which had been for centuries essential food sources for the Indians. It is interesting to know that the natives had sedulously rogued out, during flowering time, the bulbs of Poison Camas [Death camas] occurring in their prized food area, so that they could dig the camas bulbs in those areas with confidence. The bulbs of the two plants are almost indistinguishable, but the flowers are very different (those of the poisonous plant being very much smaller, more crowded, and always creamy-white). Digging sticks were used by the women to secure the large oval bulbs (which have dark, membranous outer scales). These bulbs were baked in ovens in the ground, and either eaten at once, or dried and stored for winter use. The Lewis and Clark expedition, on numerous occasions, was grateful for emergency supplies of camas. The Great Camas is named after Max Leichtlin, 1831-1910, of Baden, Germany, who introduced many fine plants to horticulture. 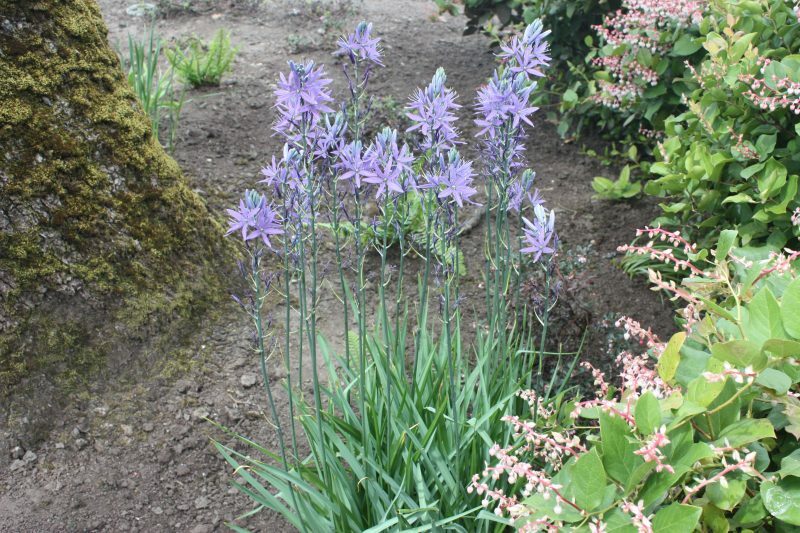 The common name is justified, for in the wet, even mucky soils the Great Camas prefers, stems to 4 feet are not uncommon, and there is a record of 205 buds or blooms in one raceme! Six spreading tepals are uniformly placed to form an impressive flower 2 – 3 1/4 inches in diameter. These flowers open progressively upward, from the base of the raceme and as the tepals wither, they twist tightly together. This characteristics provides a useful field distinction, for the tepals of the smaller and more common C. quamash shrivel separately. [I am going to have to check if these bottom tepals are twisted together]. The Great Camas can grow as tall as four feet, and once grew like weeds in meadows with soft, boggy ground –quite unlike the common camas which grows on rock bluffs. Unfortunately, its vast meadows are being lost because of housing needs. These bulb-clusters are two rare survivors which have appeared in a shopping mall’s gardens — all others (presuming there were others) were lost to construction. The colour is quite variable, from palest blue to a rather intense bluish-violet. We have seen quite a number of plants with cream-coloured blooms, and — once only — a clear bright pink… Though scarce in our area (Victoria, B.C.) the cream-flowered plant is, in the vicinity of Roseburg, Oregon, much more abundant than the blue-flowered plant. The relatively large bulbs (about 1 inch in diameter and over 2 inches long) may be 12 inches down, and since they often occur in rocky slopes in isolated pockets of rich soil, they were less important to the Indians than the smaller bulbs of the Common Camas occurring at depths of 2-6 inches. The Great Camas occurs in southeastern Vancouver Island (south of Nanaimo) and in coastal Washington. It blooms almost a fortnight later than the Common camas, in late May to early June. This fine plant is abundant almost to the point of being considered a weed in south coastal gardens, but it is cultivated and highly regarded in Europe. Climate change has helped these plants to bloom earlier: I found them in early to mid-May and their blooms are going away as I write this blogpost [May 13th]. Nor can you often see this plant in Victoria gardens, or at least I have never seen it before now. The book I am quoting this information from was written by Lewis J Clark in 1973, and its title is Wild flowers of British Columbia, [Sidney, Gray’s Publishing]. Dr. Clark was an organic chemistry professor at Uvic, circa 1970, who loved botany, wild flowers, and photography. 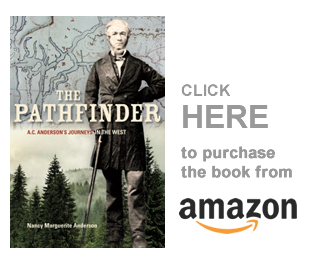 The book is still available on Amazon. Now I will have to keep an eye open for the Death Camas — the poisonous plant. I can only look in May, when the flowers are blooming, so it may take me a while to find one, if one still exists. Hi, Judy. As far as I know they are not. Camas have narcissus like bulbs which are resistant to being transplanted (many have tried without success). And I have not heard of camas growing on the east side of the Rocky mountains. I don’t think they do. Will email you.